Contemporary rock guitar riff inspired songs with delivered with emotional vocals and smart cliche free lyrics, a mixture of rock, blues, and funkin' fun. Think Gary Moore and Joe Bonamassa meet Huey Lewis! "I've always been inspired by the power of music, to entertain, provoke thought, suggest solutions, and allow us to forget about our problems for awhile. As a songwriter it can take some time to figure out what you want to say even though it seems easier to say what you mean with a guitar strapped on! It can be a bit scary, as once you put it out there you can’t take it back, so you might as well say it loud, so....... Hope you enjoy my new album and......Stand Back, I Don’t Know How Loud This Thing Gets! "Play it loud and enjoy this thoroughly excellent CD." - Blaine Morrison, Radio Host of "The Blues Own"
In October 2013 the band won the East Coast Music Association’s “Maritimes to Memphis Blues Challenge”. As a result they represented Atlantic Canada at the 2014 International Blues Challenge in Memphis, known as the premiere Blues event in the world! 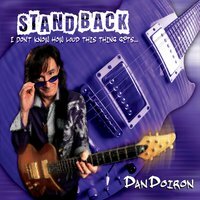 Now in May 2015 Dan is releasing his new album inspired by the trip to Memphis....."Stand Back...I Don't Know How Loud This Thing Gets!" “As my journey as a musician continues, I am aware of what a great privilege it is to perform and share my music and stories with my audience.... thanks to everyone who inspires me to Dream Big and Play Loud...."